A 5.8GHz, high definition, auto-scan, FPV diversity monitor, complete with sun shield, tripod mount and interchangable 1800mAh LiPo battery. Enjoy the exciting photo and video opportunities that this high quality 9" high definition FPV auto scan monitor allows. Bristling with the latest technology the cutting edge 5.8GHz diversity monitor uses two integrated receivers to filter the best available signal and provide a sharp and interference-free live image. Perfect for both the newcomer and regular FPV flyer, features include dual signal scan for automated reception optimization, digital noise reduction and a choice of 32 channels. Build quality is delightful, and with a sun shield, interchangeable LiPo battery (for extended use), and standard screw fix tripod mount, this is a monitor you'll find convenient, user-friendly and, frankly, hard to live without. 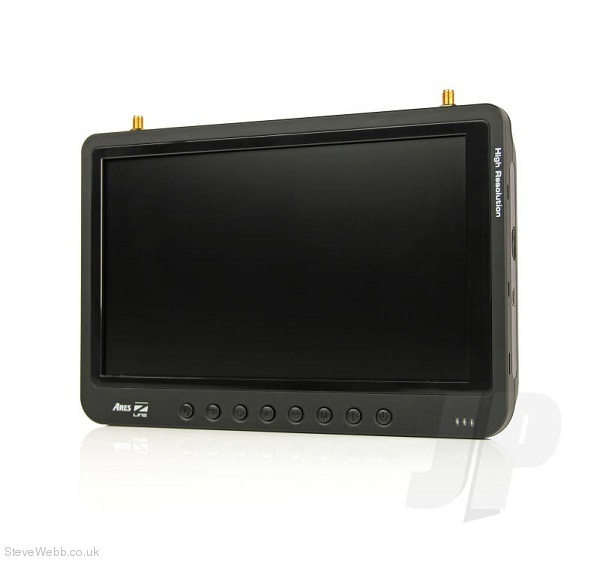 1 x Ares Z-Line 9 HD FPV monitor. 1 x Screen cleaning cloth. Twin integrated receivers filter the best available signal. 32 channels across three bands. 1024 x 600 pixel resolution. High quality TFT liquid crystal display. Standard (1/4-20 thread) tripod mount. 1 x Ares AC charger - AZSZ1036 (UK).